The quarterback is the player you have to get right when playing Daily Fantasy sports. This is the player who will score you the most points, so get him wrong, and you’re out of the equation. When picking any player in Fantasy Sports you have to be aware of the point scoring system across different sites, especially at FanDuel and DraftKings – however for quarterbacks there isn’t a world of difference, except that you’ll earn an extra three points at Draftkings if your QB throws for 300+ yards. This shouldn’t have too much effect on differing the strategy between the two sites, you’ll want your QB to throw for many yards on both sites, the player who regularly throws for 300+ yards will be a better option at DraftKings however. 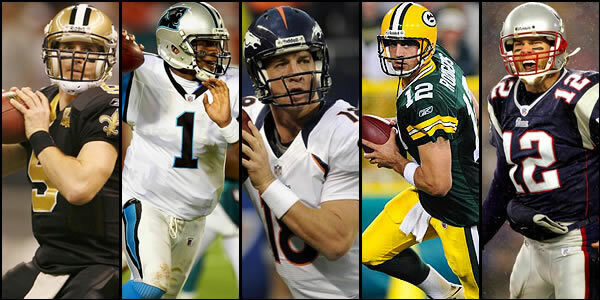 Here is a rundown of what I would consider the top five QB’s in DFS and what you might expect from them in 2014. Peyton Manning – Can we really expect another year like last year? Simple answer – No. Those seasons don’t come along very often and it would be incredible if he can repeat it. However, don’t expect him to have a bad season either. If he had scored fifteen less TD’s last year he would still have led the list, and it would be a surprise if he didn’t lead again. The great thing about Manning is that he’ll not lose you many points either; his Interception percentage the second lowest of the 25 QB’s who made the most attempts last year. Nick Foles – The Philadelphia Eagles QB was the surprise of last season, his QB rating actually topping Peyton Manning. Much of the credit for his performance has to go to head coach Chip Kelly, re-organizing the franchise completely. Foles threw just two interceptions from 317 attempts last year. DeSean Jackson has gone which is something of a worry, but a great offensive line means you can expect big things again this year. Philip Rivers – Rivers had the best completion percentage of the year in 2013, and led the Chargers to an unlikely appearance in the playoffs, earning him the comeback player of the year award. This is a guy who throws a good amount of touchdowns and the offense around him is unchanged from last year. Rivers is a good solid pick when the Chargers are at home and expected to win. Drew Brees – Drew Brees is the most consistently solid quarterbacks in the NFL – guaranteed to average over 300 yards a game for the season (342, 324 and 323 yards per game in the last three seasons). Brees has a great team of receivers around him as well as the outstanding Tight End Jimmy Graham – expect no less than excellence again in 2014 (averaging over 300 yards a game might give Brees the edge if you have a tough decision between two QB’s at DraftKings). Aaron Rodgers – Rodgers is an outstanding quarterback, his 2013 season cut short with a broken collarbone sustained in week nine. He finished the season with a rating of 104.9 and 6th in touchdown percentage (a category he led the league in 2011 and 2012). A fit and healthy Rodgers is a no risk pick and expect big numbers again this year. Of the experienced NFL starting QB’s, these are the players I expect to be able to gain you the big numbers. An honorable mention should go to Russell Wilson of the Super Bowl champions Seahawks – this guy has great figures – problem is that he’ll have way less attempts than the names above. Ben Roethlisberger also deserves a mention; much will depend on how he links up with Antonio Brown again now that Sanders and Cotchery have gone. A big question mark hangs over Eli Manning. Last year was truly awful – can he turn it around? The other question mark surrounds Tom Brady. Last year saw a rapid decline, with his worst pass completion percentage since 2004. A good start to the season and Brady is suddenly a great pick again. Here is a look at the two rookie QB’s this year who look most likely to be starting. Johnny Manziel – Manziel may not be starting in week one, but the smart money is on the fact that he will be starting by the end of the year. Can we expect big numbers? Probably not – this Browns team went 4-12 last year. One advantage you’ll have with Manziel though is that he’ll pick you up valuable rushing points. Terry Bridgewater – Once again, Bridgewater may not start week one, but this QB is cool under pressure and could become a big, big name in the NFL. Bridgewater threw 31 touchdowns for nearly 4,000 yards and just four interceptions in his final year for the Louisville Cardinals. Ready to get started in this season? Read this article then head to Draftkings to get going!